Music has the power to make us connect with our experiences and remember things better. It can elicit feelings with just a few notes! Incorporating music in your event is so important for holding the audience’s attention, providing a memorable presentation, and conveying your message clearly. If these reasons are not enough, just think back to the last conference you went to that had no background music. If you can’t remember one, point taken. Here’s how to incorporate music in your event. Creating a theme for your conference or company event is a great way to put together acohesive message. This will be especially effective if your theme carries throughout the whole event (think dining, lighting, decor, etc). Selecting music for your event gets much easier when you are working within a theme. Music is incredibly powerful at influencing audience behaviors. Before selecting the soundtrack to your event, consider the goal of your presentation . Is it to stay focused on learning something? Pick lyric-free instrumental music. Is it to engage in deep discussion or debate? Pick subtle background music that will keep attendees relaxed. Is it to boost sales or boost morale? Pick upbeat, feel good pop music that everybody knows. To pull off the presentation, you must do a run through with the music. You never know if one track isn’t going to load properly or if the room requires a louder volume than you thought. Be sure to check the sound system and learn how to troubleshoot so your event can go off without a hitch. If you are worried about the technical side of things, there’s always the option of a live band as well! Just remember that there are legal requirements when playing music at an event. Although there are some exceptions, in most instances you are required to obtain a license. Incorporating music in your event can be a great addition to take your presentation to the next level! 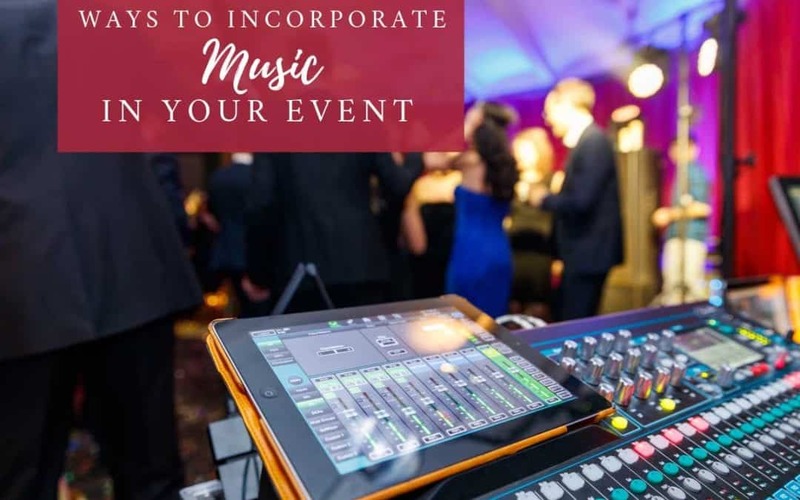 Create a theme, consider the goal of the event, and check that the sound system will perform properly so your event music can be memorable for all who attend. If you are in search of a venue for your next event, choose Earle Brown. With multiple options for AV equipment and room setups, we are guaranteed to have what you are looking for!